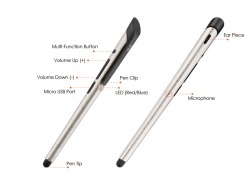 Use the stylus pen to accept phone calls when the phone is docked or to write notes and draw using the special tip. The stylus has 3 buttons, a power button, and volume up and down buttons. The sound quality of the stylus is very good, it's as clear as the phones speaker. It also contains a LED indicator, which is blue when the stylus is turned on. It's charged using the same USB cable that comes with the phone. The LED light on the stylus will be red while charging, and blue when it's finished charging. The stylus also has a vibration feature, to make sure you don't miss any calls whenever the phone is docked, and muted. This page was last modified on 23 December 2012, at 02:51.